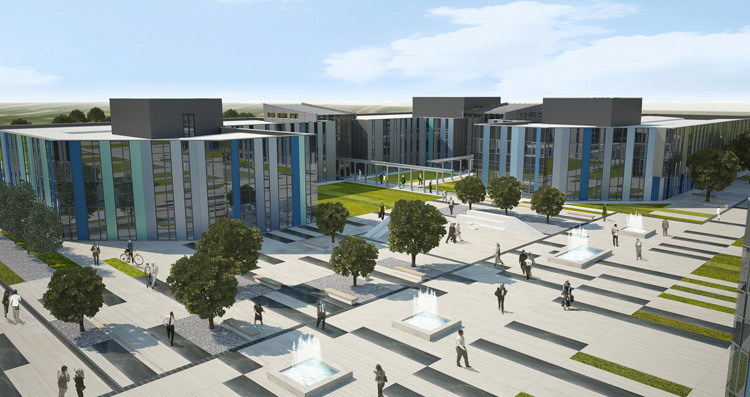 Indian property-developer Embassy Group has opened IT Park Indjija, a state-of-the-art business park which hopes to attract businesses to Indjija, a suburb of Belgrade. According to Kaushik Haritha, business development manager at Embassy Techzones in Serbia, having already expanded to Malaysia, the group is now making a move into southeastern Europe. The space, which will initially include 25,000 square meters of office space in 4 buildings and is expected to be expanded to 250,000 square meters over the next 5 years, is billed as the only IT and business park in region and will hopefully act as a hub for startups in the Belgrade area. They even have a webcam for the project, where you can see that there are certainly buildings in place, but construction continues. Phase 1 of the project includes the aforementioned office space and phase 2 will include a power center, IT university, and university campus. Then, construction during phase 3 will begin for a ‘lifestyle commercial zone’, hotel, university campus, and serviced apartments. The company is promoting this a cheaper alternative to offices located downtown, as this is 20 minutes from Nikola Tesla Airport, 20 minutes from Novi Sad, and 30 minutes from Belgrade. Embassy Group has previously developed offices in India which have housed big names like Microsoft, Mercedes-Benz, McAfee, Target, Vodafone, Yahoo!, and others. In this case, they are hoping to attract large businesses, provide space for startups, and train the next generation of IT workers. In addition to being state-of-the-art, the new office park is designed to meet all the criteria for Leadership in Energy and Environmental Design (LEED) certification, so it will serve the local community and be environmentally-friendly, to boot.